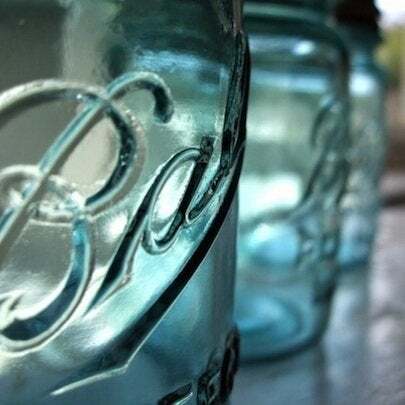 Might I tell you my very favorite thing about the ever-versatile mason jar? The design has remained essentially unchanged since 1888. Eighteen hundred eighty-eight! That’s 124 years ago. Sure, there may have been a few slight changes in logo, layout, and color over the years, but as long as the lid and ring fits securely, you can safely preserve food in them despite their age. How many objects in your home—or anywhere—can boast that type of longevity? Laura and David Elden of WE Design Studios created this eye-catching and very inexpensive chandelier using twelve wide-mouth jars, lighting kits, and various bits of hardware from IKEA. The energy-efficient CFL bulbs leave no worry about the jars getting hot (though they can stand boiling water temperatures) and make for a charming, DIY lighting solution. 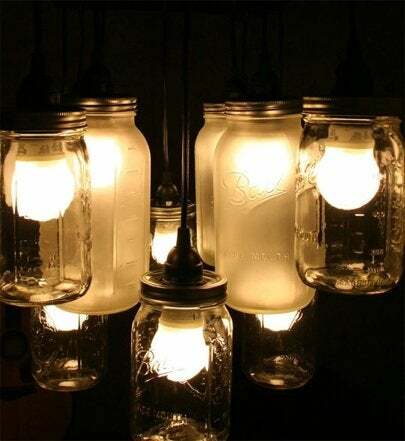 The same approach could be used to make creative pendant lights. The mason jar’s shape and strength makes it a perfect container for housing small plants, especially herbs, or fresh foliage and flowers. Camille Styles created this great vertical herb garden, which can be brought indoors when the frost hits. 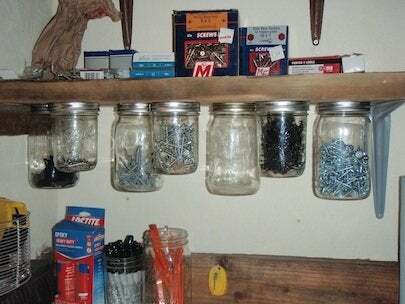 Your grandparents probably stored their nails, screws, and even small tools and drill bits in mason jars (like the one shown here from Mellish Fields West). It’s a great solution. When working on a project, it’s enormously helpful not to have to sort through boxes and bins to find the right length of screw and unlike with plastic drawer organizers, you can take the whole jar with you. 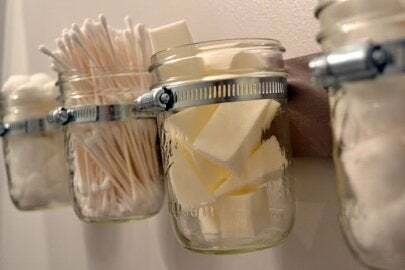 Even if they’re in matching, organized containers, keeping bathroom necessities on the vanity or countertop always makes a space feel cluttered. So get them off the flat surfaces and onto the wall. 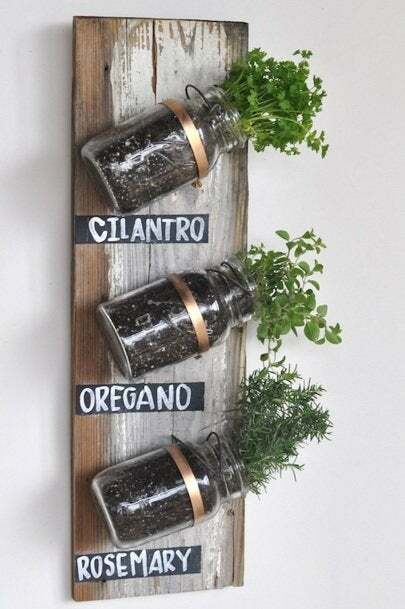 Liz Marie of Lovely Little Details came up with this clever idea using clean jars, pipe straps, and wood scrap. Brilliant! This would also make a great solution for office, art, or craft supplies in your homework space or kids’ room. 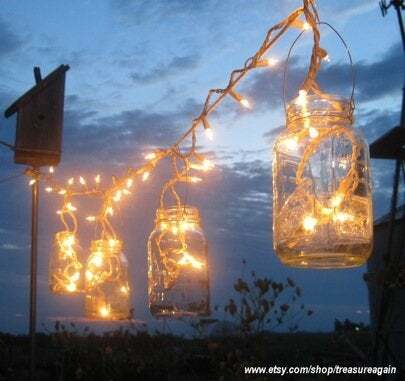 Nothing promotes outdoor ambience like something you made yourself, especially if it’s as simple and elegant as a few glowing mason jars. This string light solution from Treasure Again is fantastic and as temporary or permanent as you want it to be.